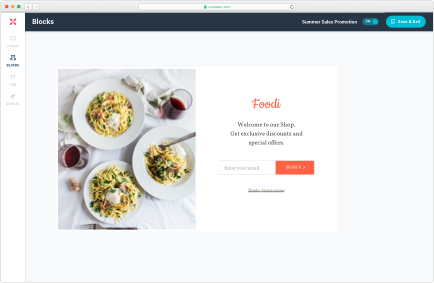 On average our customers report a +300% increase in their list building efforts when they set up exit popups. Convinced? 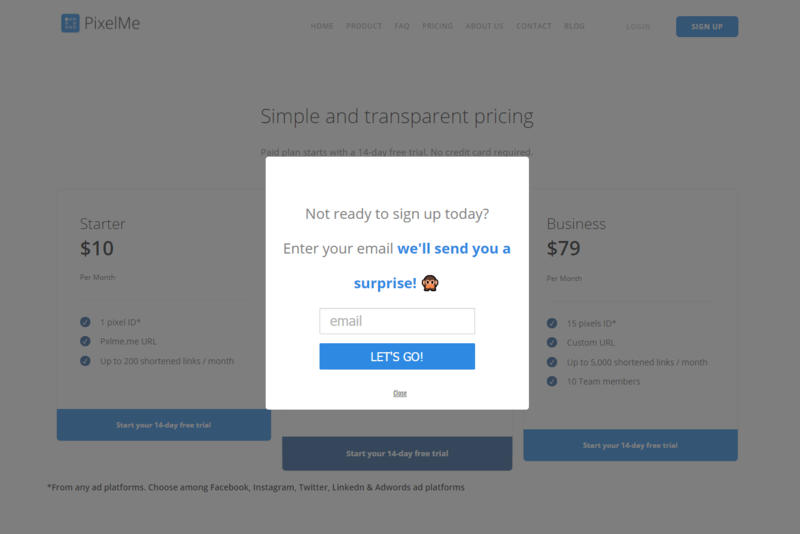 Let’s review 20 examples of exit popups you can copy. 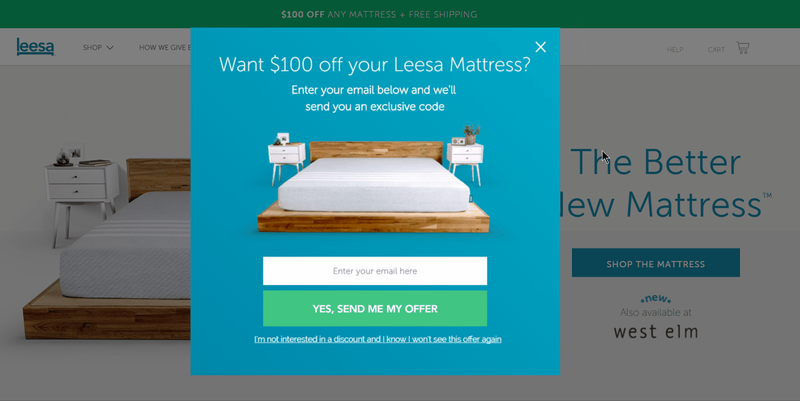 Let’s start with exit opt-in popups, in other words, email capture popups. 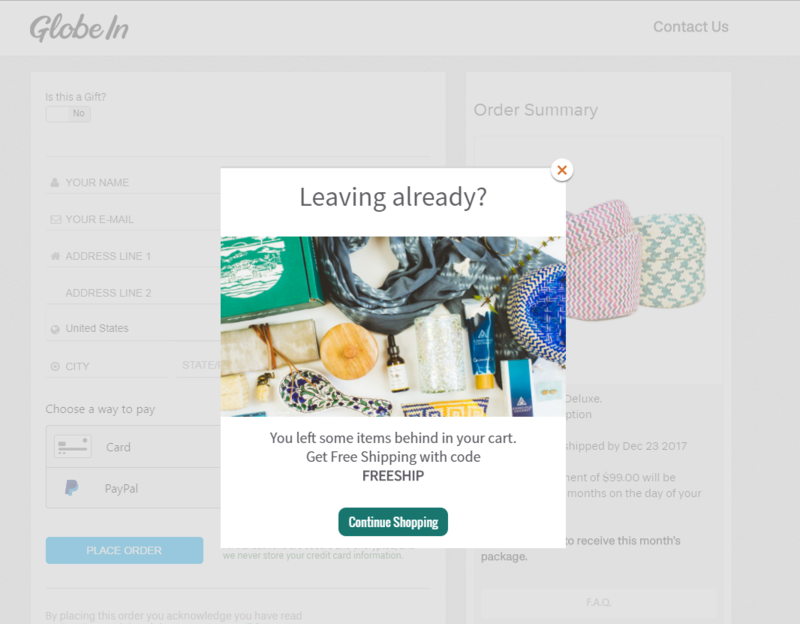 We love this exit popup displayed on lush.com. The design makes it unmissable. And their humour just makes us want to subscribe right away. This modal displayed on Trump-related articles is both very visible and highly adapted to its context. If you’ve read one article about Trump, chances are you might be interested in receiving a newsletter including Trump news. Smart! WOW went for a full size popup (a good way to make sure the visitors won’t miss it). And the visual they added made it simply stunning. 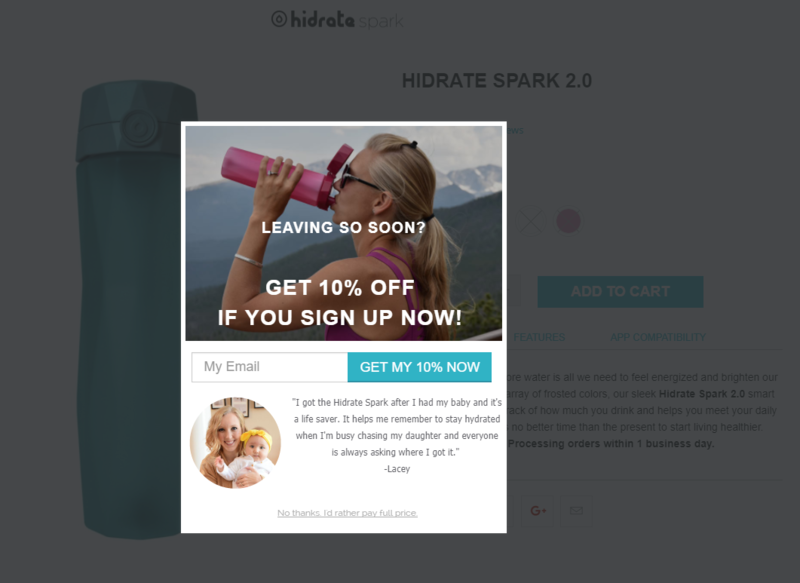 They also included a visible discount to convince the most reluctant users to subscribe. Could anyone resist it? We love this popup. First because everyone loves a $100 discount. Then, because the popup style perfectly matches Leesa’s visual identity. 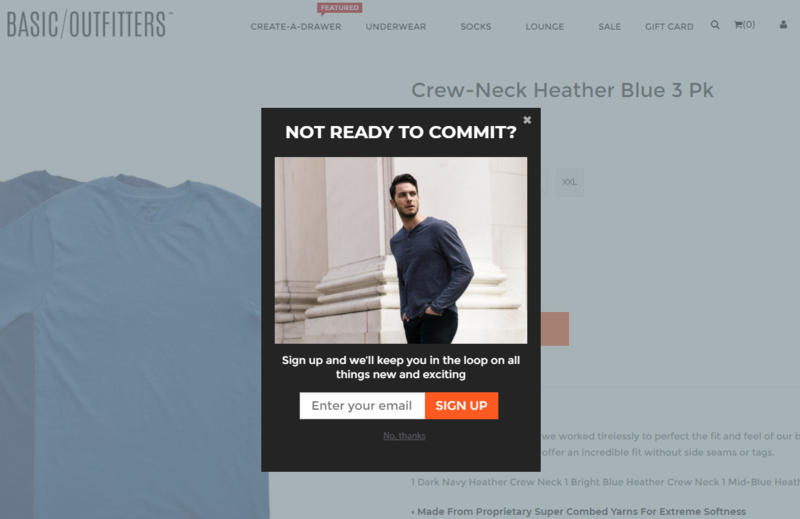 Basic Outfitters have added a catchy headline to their creation, a quick reminder of the benefits of subscribing (including a power word, “surprising”) and an attractive visual. 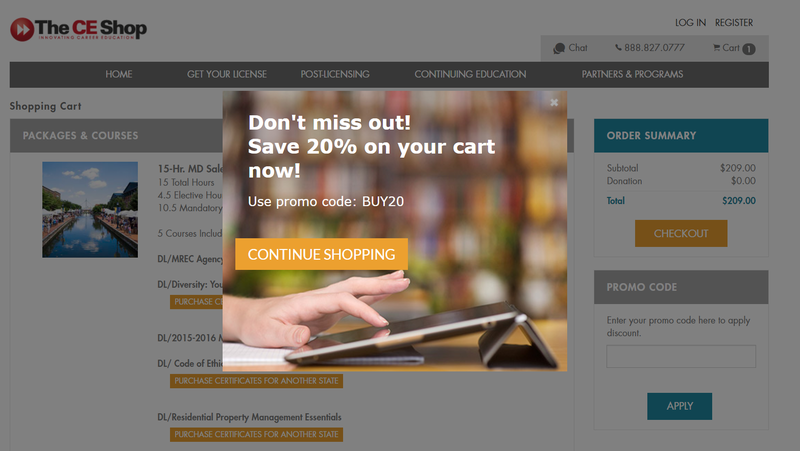 Their popup is a good example of a classic exit popup which works. The headline “Join the squad” creates a sense of community. You’re not only subscribing, you’re joining a movement. 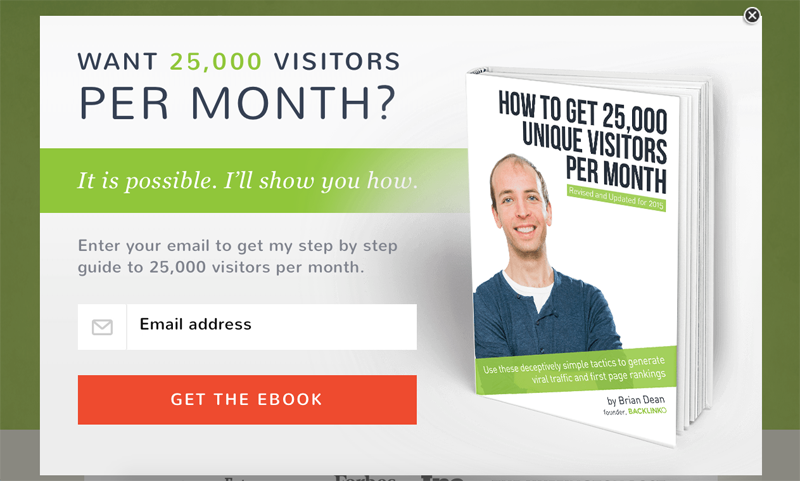 This popup by star blogger Brian Dean does a very good job of sharing a problem (“How can I get more visitors to join my website”) and providing an immediate solution. Notice also how the ebook is presented as a hardcover book. It certainly looks better than a PDF icon, don’t you think? This one doesn’t even need a comment. It’s gorgeous and simply does its job. 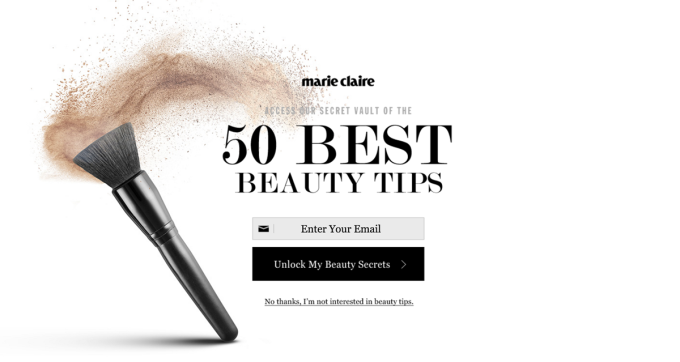 Combine a stunning visual representing the luxury universe and a good offer (50 beauty tips) and you get MC’s popup. 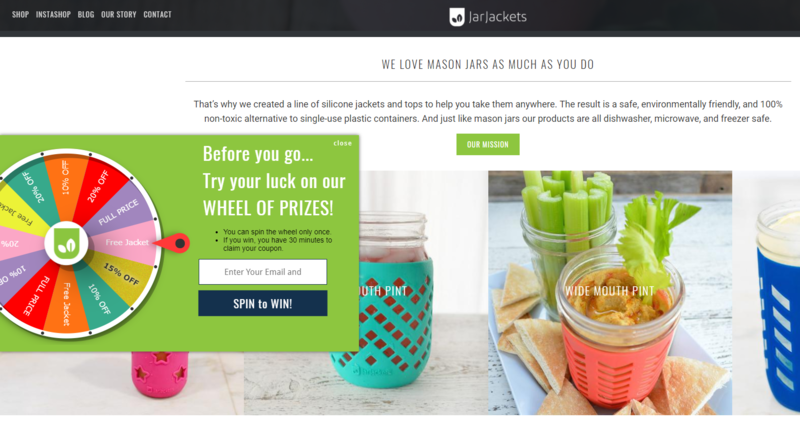 Inkbox leverages the power of exit popups and adds the power of sweepstakes. Is it surprising to see that this campaign converts almost 1 in 5 people to subscribe? No! There’s nothing better than adding a bit of fun to convince subscribers to join. Displaying this wheel of fortune on exit, JJ is sure to engage its visitors and capture their email address in no time. Le Creuset does an amazing job with this simple exit intent. 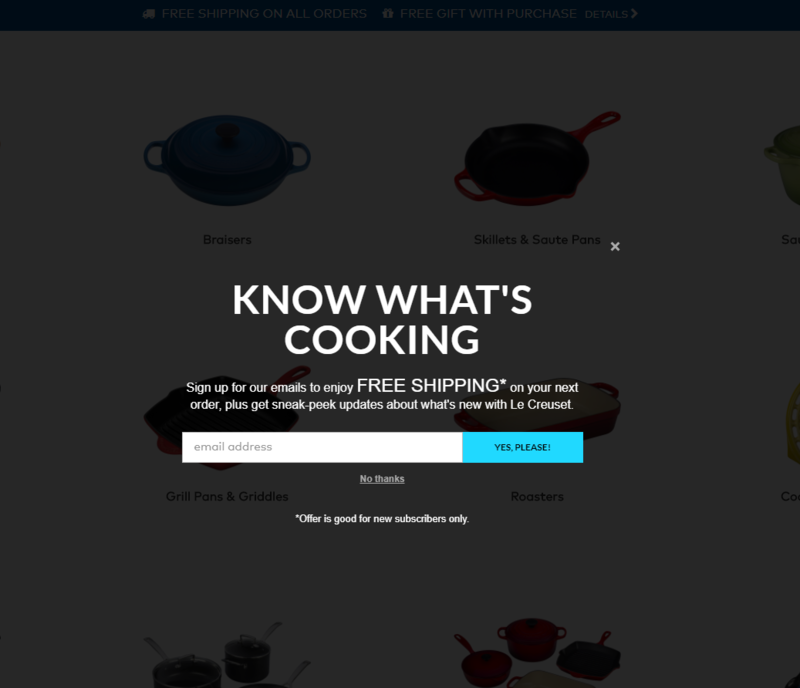 Their recipe is simple: 50% fear of missing out (“know what’s new with Le Creuset”) and 50% good offer (Free shipping). Sure exit popups are great to collect emails. But they can also help combat cart abandonment. 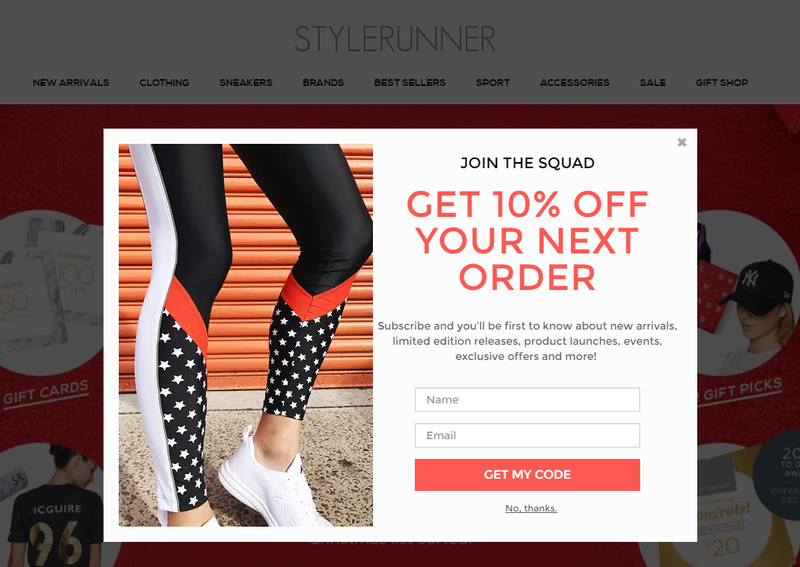 See how these websites increase their conversion rate with these smart cart abandonment popups. A good offer and a simple call-to-action. That’s what GlobeIn uses to convince shoppers to complete their purchase. It might sound simple but offering “a surprise” can be a very convincing offer. Pixelme.me converts 4.7% of the users who see this popup into subscribers. Not bad! Free shipping is still the primary motivator for purchasing from a specific retailer in the US, according to eMarketer. That’s why Brooks Brothers’ popup is so brilliant. It solves a real problem for their potential customers and provides a strong incentive to complete their order. 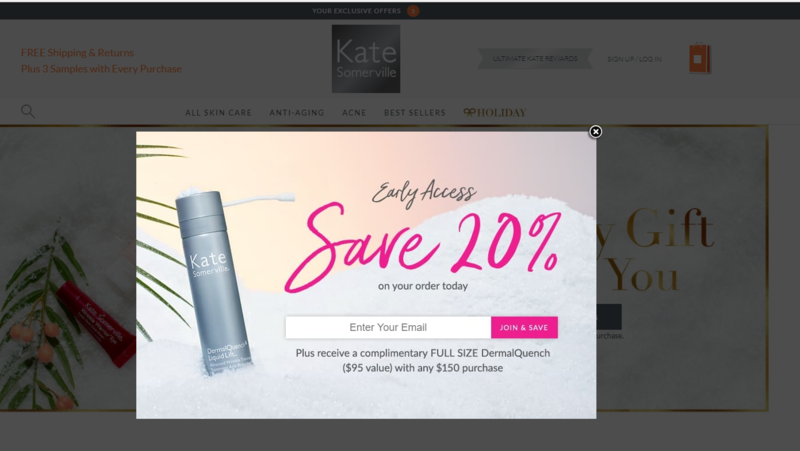 Simple, yet effective, displaying a big coupon on the cart page when the visitors are about to leave is one sure way to convince them to proceed to the payment. Displaying a time-limited offer ranks among the most convincing ways to convert a visitor now. 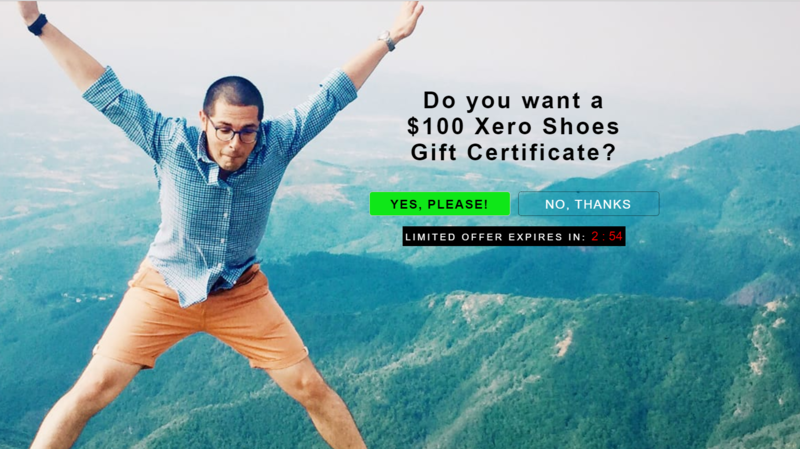 Guess what Xero Shoes is doing with their popup? They offer a coupon which expires after 3 minutes. We hope this selection inspired you. If you think we missed a good example, feel free to suggest it in the comments, we’ll be happy to add it to our selection. Ready to build your own exit popup? Sign up today (14-day free trial, no credit card required) and create your first exit popup in 5 clicks.